I was alarmed by the fact that after just 2 years, all three of these packs had appeared to degrade badly: Of the three, two of them had seen their original 6+ amp-hour capacity diminished to 2 amp hours or less (the third was at about half capacity) and their capacity was decreasing every time I checked them. Temperature variations. Very cold temperatures will dramatically reduce the available cell capacity, but these batteries were all tested at similar (room-like) temperatures. Perhaps I'd charged the cells to too-high a voltage and damaged them? I'd checked and found that the internal circuits prevented the cells from "seeing" voltages in excess to those noted in the manufacturer's recommendations. Considering the rather light usage (only a few dozen cycles) it seemed unlikely that they would suffer such damage so quickly even if they were abused a bit. Self discharge? Perhaps the protection circuits inside the battery were causing the packs to bleed down? Maybe the cells themselves were losing charge on their own? The first two of these points - while valid - just didn't seem to apply in this case. Related to the third point, however, I'd checked out and found that while the built-in protection circuits of the battery pack did continuously draw current, it was very small in comparison with the normal self-discharge rate of the packs, but the poster did bring up some interesting points about the possibility of imbalance within the battery pack itself. In my reply, I somewhat dismissed this as a possibility but in retrospect, probably a bit too quickly. More recently I finally got the time and inclination to disassemble one of my LiFePO4 packs and do a bit of looking. First, I charged the pack by connecting it to a 14.6 volt, current-limited (500 mA) source. After the current dropped to nearly zero (overnight) I disconnected it from the charger and let it sit for a week or so to let the cells "settle out" and attain a steady-state voltage. Upon dis-assembly to the point that I could measure the voltage across each individual cell I found that they were fairly close - within 0.1-0.15 volts or so - not radically different, but still a bit more than I would have expected. I then put the battery pack on my West Mountain Radio CBA-II battery tester and did a capacity test which subjected it to a constant 2 amp load while graphing and integrating the results. As expected, this pack, which had measured at about 6 amp-hours when it was new, now measured less than 2 amp-hours. Upon measuring the voltages across the cells in this discharged state the precise nature of the problem became clearer: Several of the cells were in the 2.8-3.1 volt area but one cell was at about 2.4 volts and it had no doubt been lower (probably down to 2.0 volts) when it was under the load of the tester! Did I have a bad cell? This was my first thought, but before I was about to condemn anything, I needed to do a bit more testing. I charged the pack again and when complete - but still while on the charging voltage - I checked the cell voltages and saw that at least one of them was at about 3.9 volts - just at the voltage where the protection circuit would disconnect the charging current for the entire string - and this meant that charging would no longer proceed. I then set an adjustable voltage supply to precisely 3.65 volts and connected it across each cell, in turn, for several hours (until the charging current dropped off) to assure that every cell was fully charged. Interestingly, the cell that I had thought might be bad (the one at about 2.4 volts) took a charge - and then kept taking a charge for several hours before the current tapered off. In contrast, the cell that had been at the highest voltage immediately reached full charge as indicated by the current dropping off quite soon after I'd applied it. This behavior implied a problem that was different from what I'd expected: Gross cell imbalance. One vexing problem with any system of series-connected cells (e.g. a battery) is that since not all cells are exactly the same, one will inevitably discharge sooner than the others. On "primary" batteries, this isn't too much of a problem since being non-rechargeable, a few percent of difference between cells won't have too much effect over the pack as a whole. On a "secondary" battery - the types that can be recharged - this can be an issue, especially if the problem accumulates over a number of charges. For good, old-fashioned lead-acid cells, the penalty of slightly overcharging isn't great: Gasses are produced and one can trap them (as in a VRLA - Valve-Regulated Lead Acid) so that they can be reabsorbed if not generated in excess, you can convert them back to water (e.g. catalytic recombination as is done with "Hydro Caps") or simply add water as needed. In a normal "float" service where the cells are held at a "full charge" state they constantly pull a small amount of current and if this is maintained for a fairly long period of time, cells/batteries that weren't fully charged will gradually equalize... for the most part. In other words, we can - to a reasonable extent - prevent cell inequality from occurring by purposely allowing lead-acid batteries to be "gently" overcharged and the chemistry allows this without severe deleterious effects. Perhaps the most notable of deleterious side-effect of cell imbalance is that experienced in NiCd packs where the premature discharge of one cell results in its effectively being charged backwards and a chemical process occurs in which dendrites (metallic hairs) grow, reducing its capacity and in severe cases, shorts the cell and/or causes it to self-discharge very quickly. In this case, this cell - already weakened due to dendritic damage - will be the first to discharge the next time it is used and this will happen again, causing even more degradation! In the case of a Lithium pack, this unintentional "reverse charge" doesn't occur as there are (supposed to be!) circuits that prevent any of the cells in the pack from being discharged too deeply by disconnecting the entire battery from the load - something that (in Lithium chemistry) can cause permanent damage. This same circuit also does something else: If, while charging, the voltage on one or more cells exceeds a particular threshold (typically 4.2 volts for most conventional Lithium-Ion cells) the entire battery is disconnected. For the LiFePO4 battery, the chemistry is a bit different. While the "low voltage disconnect" of these cells is comparable to that of some conventional Li-Ion chemistries (2.0 volts) the high-voltage disconnect on the particular LiFePO4 cells that these packs contain is 3.95 volts maximum. The nominal "full charge" voltage for these particular LiFePO4 cells is normally 3.65 volts. As is typical for any rechargeable cell, the voltage on a cell immediately decreases when the charging source is disconnected. Unlike lead-acid cells, if we attempt to even "gently" overcharge any lithium-ion type of cell to force an equalization, the chemistry of the cell is such that we will damage it in attempting to do so! At the very least this can greatly reduce the lifetime of the cell and in the worst case, cause a catastrophic failure such as leakage, cell rupture or even fire. When the battery pack runs down: One cell reaches 2.0 volts, the internal circuit disconnects the load. Other cells have probably not reached 2.0 volts and still have remaining charge. When the battery pack is charged: One cell (but not the same one as above) reaches 3.95 volts and the internal circuit disconnects the charging current. Inevitably, the other cells that did not reach this voltage and were thus not as fully-charged. When the battery is discharged the next time. The cell(s) that didn't get fully charged the last time will likely be the one(s) that discharge first: When that happens, the load is disconnected, but the other cells will still have charge on them. When the battery is charged again. Those cells that had the most charge will reach the maximum voltage first, leaving the more-discharged cells with a less-then-full charge. This process repeats. The disparity between those cells that are fully charged and those that were not fully charged will increase. Because the overall capacity of the pack is dictated by the weakest cell - in this case, the one that has the least amount of charge - the apparent capacity of the battery pack will gradually decrease. there is very clearly a loss of available capacity! Click on the graph for a larger version. Figure 1 shows the degradation of the capacity of one of these battery packs. The black trace shows the capacity of the battery when it was fairly new while the red trace shows this same battery pack's capacity just 2 years later. It should be noted that the load test current in the graphs on this page were 2 amps, much higher than the "20 hour rate" at which battery manufacturers typically rate batteries. Because of this, the tested capacity was somewhat lower than the pack's official 6+ amp-hour rating. In each case you can see that near the end of the discharge curve, the battery voltage starts to droop - and then is abruptly cut off by the protection circuit when one or more cells drops below 2.0 volts. What I should have noticed was that the overall voltage before the curve started to get steep was actually lower when the pack was "good" than it was when its capacity had diminished. What this indicated was that when the battery pack was newer and performing better (black trace) all of the cells' voltage were dropping more nearly in unison while on the red trace, we don't see that gradual drop to nearly the same extent implying that, perhaps, just one cell was dropping out sooner. 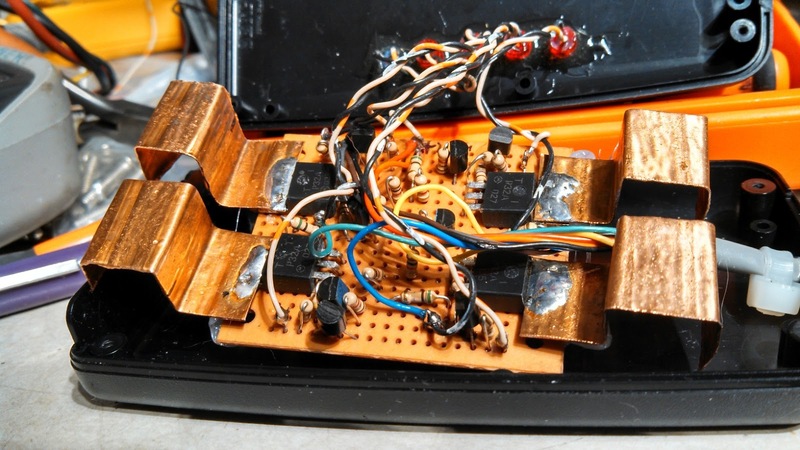 As mentioned above, I individually charged the cells using a regulated, current-limited power supply that was set to 3.65 volts and then individually tested each cell's amp-hour capacity. I was pleased to note that every cell seemed to be fairly close to its rated specifications and, as I now suspected, the cells that had been noted to have discharged first when the pack as a whole was tested were, in fact, those that had slightly lower capacity than the others by 5% or so. Same graph as Figure 1, but with the green trace showing the capacity after equalizing. The black trace is that of the battery when it was new. The red trace was that after 2 years, showing the degradation. The green trace is the capacity after equalizing the cells in the battery. Figure 2 shows the result of that test. As can be seen, the capacity of the battery pack after having equalized the cells (the green trace) is slightly better than it was when it was brand new! I did not want to remove the battery's built-in protection circuit as it takes very few cycles of gross over/under voltage before one permanently wrecks Lithium-Ion cells. While LiFePO4 cells are considered to be (more or less) "intrinsically safe" when compared with conventional Lithium-Ion cells, that just means that they are less like to catch fire/explode if mistreated, not that they won't degrade quickly! A practical method of charging the battery pack and maintaining equilibrium of the cells within. What this meant was that I was not going to disassemble the pack every time I wanted to charge it so that I could get at each cell! Charging/equalizing should be relatively simple and convenient. This goes with the above and it would imply a simple box that I could connect to the battery while charging, when I wanted to equalize the cells. One thought was to attempting building a circuit into each LiFePO4 battery pack. The problem with this idea was that there was not very much room in any of the batteries in which to fit a circuit - much less a way to dissipate the heat that was likely to be produced when the action of the circuity prevented overcharge of specific cells! Additionally, any circuit that was left connected full-time would have to be designed to minimally load the cells and run them down when not being charged. Needless to say, it would also be time-consuming to build a circuit for each battery and with the lack of room, there would be the likely need to repackage each battery to accommodate the circuitry! Instead, I decided to modify each pack, bringing out connections from each individual cell so that the voltages could be monitored and controlled during "normal" charging of the pack. To do this, I added a short cable with a 5-pin DIN connector which provided the points needed to which I could connect an external box with which the cells could be equalized when charging. What this also meant was that I needed to construct only one external device to monitor and control the voltage on three LiFePO4 battery packs that I had! could scale this design up to accommodate practically any number of cells. The "X" in the leads marks where the connector used to attach the charge equalizer to the battery would go. that the device was still connected. Click on the diagram for a larger version. Figure 3 shows the circuit that was constructed to aid in properly charging and equalizing the voltages of the cells within the battery. Based on the readily-available TL431, this is a simple shunt regulator that, if the voltage across any cell gets to be too high, starts to conduct the current around that cell by clamping the voltage to the maximum level. In this way, if a cell reaches full charge before the others the shunt regulator will allow the other cells to continue to charge and, eventually, all cells will reach voltage equilibrium: For our purposes, this is the best we can do in assuring that all cells are charged equally! Please note that the diagram in Figure 3 represents what would be required for just a 2-cell (nominally "6 volt") LiFePO4 battery: One would simply replicate the circuits as needed for as many cells as the battery pack contained, connecting them in series as shown in the diagram. For the discussion below, we'll generally refer to the parts in the circuit connected to Cell 1 which are numbered with parts designations in the "100's". As noted above, wires are connected to the cells inside the battery pack and brought out through a cable that is separate from the main power connector. I used a 5-pin female DIN connector as it had precisely the number of connections needed: Battery - (minus) and the + (positive) terminals of each of the four individual cells. You will note that in the diagram there are devices marked F101 and F201 which are 1 amp, self-resetting thermal fuses located at the point where the wires connect to the cells (or protection circuit) inside the pack. These are extremely important as an accidental short-circuit of one of the wires emerging from the pack could result in burns or a fire without its presence as the cells will easily supply enough current to burn the wires open! Adding these devices is a cheap way to make the modification safe and should a short occur, simply fixing the problem (removing the short) will cause the fuse to automatically reset when it cools down - more on these devices later. The heart of the circuit is U101, a TL431 shunt regulator - a part that may be found in nearly every PC power supply. This device is essentially a programmable Zener diode: If the "adjust" terminal is more than 2.495 volts (nominal) above the anode terminal, it will conduct via the cathode. The values of R103 and R104 are chosen so that if more than 3.65 volts appears between the "top" of R103 and the bottom of R104 (which is also connected to the anode of U101) more than 2.495 volts will appear on its adjust terminal and the device will turn on. When U101 turns on it will start to "pull down" on the base of Q101, a PNP power transistor, which will conduct, amplifying the effects of U101 and start drawing current through R101 (R102 keeps Q101 turned off otherwise.) Were it not for the presence of R101, a 0.25 ohm resistor, the "knee" of this conduction would be extremely steep, but this resistor gives the circuit a bit of elasticity (a bit of range over which the current will go from nearly zero to maximum) and also assure that the circuit will not oscillate. With the parts in the diagram a current of about 200 milliamps through the shunt regulator - plus the finite gain of U101 - will result in a clamping voltage on the cell of around 3.75 volts, not including the effects of the resistance of the wire/connector that runs to each cell within the battery. As a convenient indicator that the U101 circuit is actively shunting current from the cell, Q102 detects when U101 is "pulling down" on the base of Q101 and turns Q102 on, causing LED101 to illuminate. Q102 and associated components (LED101, R105, R106) are optional if you don't need an indication of a particular cell reaching full charge. Finally, there is also a simple circuit consisting of R1 and LED1 that is across the entire battery. The sole purpose of this is that of an indicator to show that this circuit is connected to a battery and serve as a reminder that it should be disconnected when charging is complete! As noted above, by cascading multiple copies of this circuit one may apply them to as many cells as needed - whether it is just a pair of cells, or many more than that. Because my LiFePO4 packs were "12 volt" types with 4 cells in series, I cascaded 4 of the circuits together, building it on a small piece of perforated prototype board as shown in Figure 4. The type of prototyping board that I used has a small copper ring around each hole making construction much easier, more rugged and more durable. I do not currently have plans to produce a circuit board for this project, but let me know if you do as it might be of interest to others. The TIP32A PNP power transistors are of the TO-220 type (with metal tabs) and were chosen simply because I had a lot of them on hand, but practically any PNP power transistor could have been used - but I would not recommend Darlington types due to possible emitter-base voltage limitations. As can be seen in Figure 4, pieces of copper, bent to fit within the box and to increase surface area - were soldered to the tabs of these transistors to improve power dissipation. With the heat sinks shown and with the box put together, the unit can easily withstand 200 milliamps of shunt current on each of the four sections without causing excessive thermal stress of the components inside from the 3-4 watts total heat generated. If much more shunt current capacity is desired, larger heatsinks and/or better ventilation - or perhaps connecting the transistor's tabs to a metal box (making sure that their heat sinks were electrically insulated) - would be recommended along with the decrease of the value of R101. Practically speaking, by proper choice of the transistor, the value of R101 and heat sinking one could design this sort of circuit to accommodate practically any amount of shunt current! In the lid of the box I drilled some holes and used cyanoacrylate ("Super" tm) glue to to hold the LEDs in place temporarily (overnight) and then used clear epoxy to more-permanently secure them into position afterwards. Because this shunt regulator was intended for 4 cells, there is a red LED for each of the shunt regulators to indicate its "full charge" status plus a fifth, bright blue LED as an indicator to show that the unit is, in fact, connected to a battery a serves as a reminder to disconnect it when charging is complete. cell(s) are at full charge - plus a "power" indicator. Figure 5 gives a view of the completed shunt regulator showing the short cable and the male DIN connector that is connected to the mating connector on the battery. As the label indicates, the five LEDs on the front show the full-charge status and whether or not it is connected to power. It is worth noting that when they were installed, the LEDs weren't fully pushed to protrude through the front panel. If they had pushed all of the way through the hole, they would have stuck out too far and would have risked being accidentally broken loose and pushed back into the box during handling. A "simpler" way to do this: In theory, one could parallel a fairly low-value resistance across each cell - say, a 22 ohm, 1 watt device - and achieve equalization with this value of resistance equating to about 165 milliamps of current at 3.65 volts. Eventually - after, perhaps 36-48 hours for a pack of this size - the cells would gradually equalize their charges - and the lower the resistance, the more quickly equalization will occur. If this is done, resistors with the appropriate power rating should be used and they should all be of equal value and, of course, they should be disconnected immediately after charge has been completed, just before the charging voltage is disconnected. Failure to remove these resistors after the charging voltage has been removed will surely run down (and likely ruin!) the battery! For other than LiFEPO4 cells: For different types of cell chemistry one would choose the values of R103/R104 as appropriate (see the data sheet for the TL431 for more information.) Note, however, that this circuit will simply not work for voltages much less than 3.0-3.2 volts! If, for example, one wanted to regulate "2 volt" lead-acid cells you could use this sort of circuit directly, but multiple regulators could be placed across pairs of cells (and the shunt voltage set to approximately 4.55 volts) in an interleaved manner and achieve the same effect. Make sure that all circuits are equal: Once constructed, the clamping voltage of the individual cells' circuits should be checked at the same current, say 200 mA and if necessary, adjust the value of R103 or R104 to make all of them equal: All cells being within 50 millivolts (0.05 volts) of the target voltage should be more than adequate. It's worth noting that normal variations in the resistor values (particularly if 5% tolerance parts are used) as well as variations among TL431's can cause voltages to differ slightly. Where to find the TL431: As mentioned above, the TL431 can be found in nearly every PC-type power supply made. If you have some scrap power supplies laying around, you may be able to find enough of these devices for your project! The devices that I used are in TO-92 packages and look just like a transistor. Different manufacturers have their own prefixes, but if you see a part that looks like a transistor and ends in "431", it's probably a TL431! If you don't want to dig around in old power supplies, these chips are readily available from many distributors at well under US$1.00 each. Because of the high currents involved, there is some risk of burns/fire should connections be accidentally shorted. Do not perform this sort of modification unless you know exactly what you are doing! One of the more critical aspects of this projects was safely modifying the battery pack. 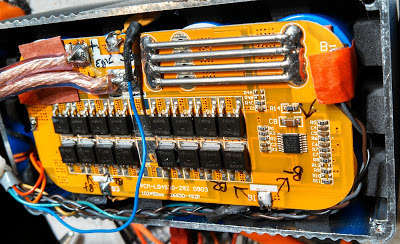 As noted above, the wires connecting to the outboard charge equalizer have current limiting on them in the form of (approximately) 1 amp, self-resetting thermal ("PPTC") fuses that are located inside the battery's case. For a Wikipedia article on these PPTC devices, click on this link. Again, the fuses are necessary safety components to prevent burns/fire should the added connection(s) be accidentally shorted out! Some builders may not be familiar with these self-resetting fuses so a few words of explanation are in order. Typically resembling small, yellow disk-ceramic capacitors, these devices are actually specially-designed thermistors: If the current through them exceeds the design threshold, they will get hot (but not too hot!) and their resistance will skyrocket. When in this "tripped" state, enough current will still flow through them (typically 5%-15% of the rated trip current) to keep them "warm" and in the "tripped" condition with a high resistance. Once the fault has been removed, they will cool down and reset themselves as their internal resistance returns to normal. This shows the modification to one of two identical packs. These devices are readily available from electronics suppliers like Digi-Key, Mouser and Jameco (to name but a few) and aren't all that much more expensive than normal "one-time" fuses. Available in current ratings from below 100 mA to 10's of amps, the 1-amp rating noted is a suggestion: The devices that I used were actually rated for 1.1 amps of "holding" current, but anything in the range of 0.6-1.5 amps would have been just fine in this application as that current range will keep the wire from burning up in the event of a short, yet be enough to handle the expected shunt current. As mentioned, when "blown", these self-resetting fuses do not completely stop the current flow, but reduce it to a "safe" level. What this means is that should the wire be shorted out indefinitely, the affected cell(s) will eventually be discharged (and the cell damaged/ruined!) but you aren't likely to set anything on fire - and this is particularly important since our connection to the cells must bypass the protection circuits within the battery pack! Of course, if you wish you can substitute "normal" (one-time) fuses. While these have the disadvantage of being usable only once, they do have the advantage that if a wire shorts and the fuse blows, current completely stops and you won't likely run down - and possibly damage/ruin - a cell. on the protection board to the cells were identified and marked. 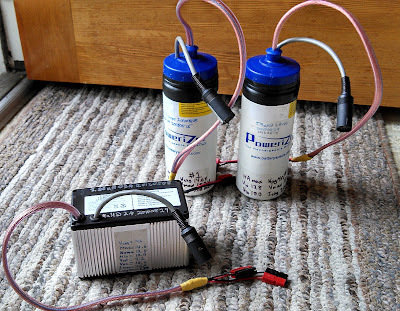 Of the three LiFePO4 packs that I modified, two of them were built into plastic water bottles, the original intent being to provide power for bicycle lighting and being placed in the water bottle holder. These packs actually contained two individual battery packs (a "4S+ 4S" configuration) - each with its own protection circuit. Rather than connect two equalizer circuits to the pack (one for each "sub-battery") I simply connected the cells of the packs in series-parallel - as is the normal practice - leaving in place each of the protection circuits. The end result is that there now one series-parallel sets of cells and two parallel protection circuits. The other pack (Figure 7) was constructed in the traditional way: Series-parallel connected cells (four pairs in series in a "2P4S" configuration) to get the desired voltage and capacity and as such, the modification was much easier to accomplish. To find the connections to the individual cells, the battery packs were (carefully) disassembled and the locations of the individual wires traced. Using a voltmeter, find the "bottom" cell of the pack (usually marked "B-" and using it as a reference, locate and mark each subsequent cell by the successive increase in voltage. Often, these other cells are marked "B1", "B2", etc. with the "top" cell marked with "B+". Note that it is not necessary to put a fuse on one of the "end" leads (the B+ or the B-) - but I usually omit the fuse at the B- lead: It is safe to do this as any possible combination of wires being shorted will always involve at least one fuse in the leads! Note: On the battery packs, female DIN connectors are used to prevent accidental contact with the voltages that are always present on these pins. When I charge my LiFePO4 packs I set a current-limited voltage-regulated supply at 14.60-14.70 volts which works out to 3.65-3.675 volts per cell - just enough to trigger the shunt regulator on each cell were the voltages to divide equally. When I connect the battery to the supply, I also connect the cell equalizer/shunt regulator and then walk away for a while. At a maximum charge current of 1 amp, I typically allow 12-16 hours for the pack to fully charge if it is already reasonably well-equalized. Through experimentation, I determined the precise voltage at which all four shunt circuits would conduct at 150-200 milliamps - which turns out to be about 14.72 volts for the device that I'd built. When the current from the power supply settles down this amount for a few hours I know that the voltages on the cells are equalized and that the battery should be removed from the charging voltage. At a setting of 14.60 volts overall, a well-equalized pack is obviated by all four red LEDs equally glowing very dimly once full-charge has been achieved. The first time I used the device on a battery pack that was known to be badly out of equilibrium for which I had NOT already charged each cell individually, it took 24-36 hours for all of the cells to come to equilibrium. What happened was that once the "most charged" cell achieved its target voltage, the shunt regulator took over for that/those cell(s) and the others were charged by the "excess" current being passed around the fully charged cell(s). Because this shunt current was only on the order of 100-200 milliamps, it took quite a while for these other cells - some of which were still at only 20-25% charge - to be fully "topped off" at this rather low "charge" current. One does not need to use this device every time a battery is charged. It takes several cycles (and time!) for the cells within the battery to "drift" apart and fall out of equilibrium so one could probably get away with using it only every 6-12 charges (or 3-6 months, whichever is sooner) and still maintain good charge capacity on the battery pack. Once the charging has been completed, the battery should be disconnected from the power supply used to charge it and the equalizer circuit should be disconnected immediately. This equalizer circuit, when the voltage(s) on the cell(s) are below the clamping threshold, doesn't draw much current - somewhere in the 3-5 milliamp range - so it is not likely to discharge a pack of this size very quickly. If this were were left on a battery connected across a small solar panel, for example, its contribution to the discharge of the battery would be negligible. One of the ways to most-quickly "kill" any Lithium-Ion based cell is to maintain it at a full charge voltage all of the time: Best longevity is generally obtained if it is kept it in a relative state of discharge (30%-60%) and charging it fully only and just before you need it as keeping it in a state of "partial charge" reduces the rate of inevitable degradation that occurs over time due to the intrinsic chemical decomposition. One must also be aware that allowing the voltage on any cell of a lithium-ion battery to drop below 2.0 volts can also damage or make it unusable: On some packs, if a cell voltage drops too low the protection circuit will actually prevent charging. Remember that this discharge can occur "naturally", due to the current leakage in the cells themselves as well as the very slight, constant drain of the battery protection circuit so it is recommended that one check - and at least partially "top off" the cells/batteries every 6 months or so. It should also be noted that this self-discharge rate accelerates rapidly with increasing temperature and can be alarmingly severe at higher temperatures such as those above 90F (32 C): Under those conditions - should it be necessary to store them that way (avoid it if you can!) - they should be checked more often! With this in mind, I generally keep my Lithium-Ion power packs in partially-charged state - or at least never leaving it on a charger for long periods - and have had good luck over the past 15 years or so that I have been applying that principal, typically getting at least 5 years out of the "new" pack before its capacity drops below about 60% of its design. So was the intent when I got these new LiFePO4 packs: I would top them off occasionally - usually just before using them - and when I was done, I'd typically leave them in their partially-charged state. Again, I'm reluctant to put these batteries on a charger, set to 14.6 volts (3.65 volts/cell) and just walk away. In theory, if I did do that they would eventually reach equilibrium as the fully-charged cells, having gotten above their maximum voltage threshold would occasionally self-discharge just below it and allow charge current to be applied across all the cells in the pack, if even occasionally, for a brief moment. Again, doing this will inevitably reduce the overall lifetime of the battery, but perhaps this is an acceptable tradeoff for you. What the "protection" circuits current found in batteries should really have is a more intelligent charge management capability in that if one cell was at a higher potential than one or more of the others, current would be shunted around it, allowing the other cells to equalize. Alas, that's not the way they work, hence this need/purpose of this project! Note: In one of the comments below, the existence of such a circuit is discussed briefly, but I don't have direct experience with them. Why don't other LiIon battery types experience this "inequality" problem more readily? Part of this has to do with the fact that many of them (e.g. batteries in laptops) are typically "stored" in the device and kept at full-charge voltage all of the time and will eventually equalize. Again, lead-acid (e.g. car) batteries along with NiCd and NiMH cells are less-often subject to this problem (inequality related to charge/discharge rather than cell degradation) mostly because they can be subjected to a degree of abuse (overcharging) without worrying too much about damage, and this allows all of the cells to equalize. Since you can't do this to Lithium-ion cells and expect them to last a long time, this "purposeful overcharge" technique isn't really an option! readings taken when the battery was "new" and "equalized." Discharge current for all tests was 2 amps. This is higher than the more typical "20 hour"
for the "Metal (5/12)" data was not available, but drawn-in based on notes. As you can see in Figure 9 there was significant degradation of capacity as the cells drifted apart from each other, rapidly decaying in just a few months (5/12 to 9/12). Packs #1 and #2 are identical, originally consisting of a pair of LiFePO4 packs connected in parallel at the outputs of the protection board (one of these was depicted in Figure 6) while the "Metal" pack had just one protection board with the cells originally connected in series-parallel format. All three of these packs were used approximately equally, but it's interesting to note that the metal-cased pack seems to have degraded far less: Was this due to differences in usage, or because of the way the cells were configured? It could be that the "metal" pack with its "2P4S" configuration (rather than the original "4S+4S" format of the water bottle batteries) the rate-of-change of their respective states of charge from the pairs of cells in parallel caused a slower rate of degradation. It's also interesting to note that in the case of the metal pack and water bottle #2, the capacity after equalization was actually higher than it was when new, indicating that when it was "new", the cells were already drifting apart and that the cells' capacities probably haven't degraded much in the 2+ years since they were made! What do I think about LiFePO4 cells now? I'm more than willing to concede that, perhaps, there is something to this longevity of LiFePO4 cells after all. As can be seen above, once the packs were equalized the cells seem none the worse for wear after several years have passed, along with a degree of abuse! What about this (apparent) propensity of the cells to drift apart? It might be interesting to have another pack that is left "on charge" for long periods of time to see if it will equalize itself and/or if it degrades at an accelerated rate. It could also be that newer protection circuits and cells are more likely to maintain a closer charge state than these (now) older packs. Perhaps other brands of batteries would be less susceptible to this problem. Would I get more LiFePO4 batteries in the future? Yes, now that I know that I should be on the lookout for a problem like this! Since I purchased these battery packs from Batteryspace.com, they have started offering "equalization boards" for LiFePO4 battery packs designed to address this very problem although there was no indication that these specific battery packs described on this page (which appeared to be still sold at the time of posting) contain such circuitry. While I have not used these specific equalizer boards, comments that appear elsewhere on the web indicate that these types of boards do the job for which they are intended. If you get a LiFePO4 battery (2 cells or more in series - that is, more than 3.6 volts or so output) I would strongly recommend that you make certain that it includes a charge equalizer - or be sure to add one yourself! If you already have some LiFePO4 battery packs and are not absolutely certain if they have equalizers, you really should check it out - and if they don't, add them! I recently re-tested the three batteries depicted above and found that their capacity ranged between 4.8 and 5.4 amps-hours - this for batteries that were at least six years old. Based on their capacity when they were new, they have lost somewhere around 20% of their original capacity in that time. While I'm a bit skeptical that they will make it to the 20 year mark it is worth noting that practically any lead-acid battery of this same age would have since been relegated to the recycler! This is the best information I have ever found on any kind of battery. I've been contemplating a similar circuit using the MCP73223 from Microchip. 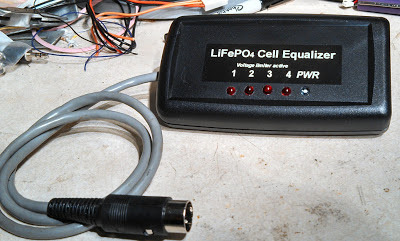 It's a $2, 2-cell charge controller specifically for LiFePO4 batteries. Thank you for the info on the MCP73223 chip. While it does provide the necessary over/under/precharge features, it looks as though one would still need to come up with some sort of charge equalization technique for multi-cell packs. Thanks also for the link to the BatterySpace.com LiFePO4 charge/discharge controllers with the built-in equalization feature. In my opinion, it would be advisable that *anyone* contemplating the use of multiple, series LiFePO4 cells in a battery to include such a circuit in their packs to maintain usability over time! Also, I think that it would be of disservice to any customer - not to mention the seller - for any vendor to *not* include a similar circuit in any multi-cell/series LiFePO4 packs that they sell! Nice post. I use a lot of LiFePO4 batteries actually my laptop is supplied from one right now. I work on a 3 to 8 cell LiFePO4 charger or more precise programmable solar charge controller since that is what I need for my off-grid setup and there is no product available to met my needs. Is in Beta stage at the moment and I hope to work on it in this winter (I have other priorities right now). The model will be called SBMS4080 (Solar Battery Management System 40A charge 80A discharge) this are max limits it can be programmed for lower over current protection. Even if it has a 32bit ARM micro-controller and LCD for user interface and individual cell measurements it will only use under 2mA so it can be used on smaller systems. It can be used with any type of Lithium cells since all parameters are programmable can even be used with ultra-capacitors. Measure the current taken to power the monitoring board from each cell. If it's not almost identical, it leads to cell imbalance especially if not charged and discharged on a regular basis. Many users in the EV and Marine community using LFP prismatic cells have discovered they don't really drift apart in normal use....if they were balanced well to begin with. And no active BMS balancing was needed. I'd measured the current consumption of the monitoring circuits some time ago and found them to be in the general range of 100-ish microamps - fairly consistent across each cell. While not negligible, this seems to be within the range of similar devices that I have found on various types of Li-Ion battery packs over the years. This level of discharge also seems to be commensurate with the effective self-discharge current of typical Li-Ion cells at room temperature - a rate that increases dramatically as cells age and/or temperature increases. I'd originally thought that, perhaps, more current was being drawn across one cell as compared to the others, but this doesn't seem to be the case. Also, the battery packs seemed inconsistent as to which cell, exactly, was the "low" one and which was the "high" one in terms of charge which also meant that the difference was likely more in the cell itself rather than the monitor circuit. What this implies is that the cells, themselves, aren't made equal - not a surprising revelation for fairly inexpensive, Chinese-made cells of this sort! While having matched cells would be ideal, I've observed that, over time, they just don't "stay matched", anyway - particularly in those battery packs where some cells exist in different thermal environments as compared to others within the packs: A common example of this are NiCd cells found in power tools: I've noticed that the "inner" cells often fare worse than the "outer" cells since the former cannot as easily dissipate heat and degrade more quickly. To be sure, one way to minimize mismatch would be to leave the battery pack at a constant float voltage all of the time - the de-facto mode of many computer batteries that spend much of their lives on the charger. In this state the cells do gradually equalize on their own, provided that there does not exist a gross imbalance amongst them in terms of self discharge current. Unfortunately, leaving any Lithium-Ion chemistry based cell in this state is likely to be more harmful to their overall longevity owing to the more rapid cell decomposition at the higher voltages. could some1 explain a bit on the following: with the circuit as described, with say 2A charge going into series of cells, when the shunt kicks in and places .25 Ohm resistance across the terminal of the cell(s) that are at 3.75v - why does only 200ma current flows through the resistor ? The battery is at 3.75, so .25 Ohm resistor (plus negligible resistance of the saturated PNP transistor) should result in much higher current ? Just having a mental block for some reason. May be due to 2 sources of current - one coming from the charging circuit and another one from the battery cell (one at 3.75) itself, discharging through the shunt resistor . One of the characteristics of these cells when they are nearly fully charged is that their effective impedance goes up and this can be verified by noting that with a constant-voltage supply charging a cell, the current drops when it nears the "full charge" voltage. As for the limitation of current by the shunt regulator, the transistor will conduct only above the threshold voltage of the shunt regulator - but since the voltage will drop when the current flows, it is intrinsically self-limiting. The 0.25 ohm resistor is there to soften the "knee", which is to say the "abruptness" at which an increase in voltage will cause an increase in current. If one cell charges more quickly than the others and that particular cell's shunt regulator conducts, current will be shunted to the other cells, charging them. As all four cells reach their threshold voltages for their respective shunt regulators, this "knee" allows the current to gradually equalize. Hi, regarding "Related to the third point, ... battery pack did continuously draw current, ". Did you measure the actual current of the original circuit? How bad was it? Bumped your blog by mistake, great work! The "protection" circuit for this pack drew something significantly less than 100 microamps, but I don't remember exactly what. For reference, an application can draw 100uA from an alkaline AA cell and if it can operate from 1 volt/cell, it will easily operate for one year. Considering that an alkaline AA cell typically has between 2.2-2.8 amp-hours and that these packs have >6 amp hours, it would seem likely that from this current discharge alone, worst case, would take quite a while to discharge the pack. While I prefer to leave the packs in less than "completely charged" state (e.g. down a few 10ths of a volt, at least) to maximize the chemical stability, after the first week or so after having charged, I see very little change in open-circuit voltage from month to month. I suspect that the self-discharge of the cells themselves and that of the protection circuit are probably on par with each other, but this is only a guess as I have not rigged a long-term test fixture to measure the former. I have some doubts in regarding to a System powered by LiFePo4 cells. However, in regarding to the discharging, I only have the PCM. Which turns off the load once it's reached 2.3V. I had been reading that it must disconnect from the Load when reach 2.7V. Should I use another circuit to disconect the load? What do you suggest? Some protection circuit boards (most that I have seen) will protect against overcharge AND over-discharge, so you may want to verify the capabilities of your PCM. You mention 2.3 volt/cell cut-off, which is still in the "safe" zone for LiFePO4's, but lower than recommended. A short answer: Yes, you really should protect against "over-discharge". Ideally the protection circuit would monitor each cell's voltage and disconnect the pack if just one dropped too low, but practically speaking - particularly if the cells are balanced - it is reasonably "safe" to monitor only the total pack voltage and disconnect it if it drops below an average voltage of 3.0 volts/cell (e.g. 12.0 volts for 4 cells) - at least at fairly low discharge rates rates (<=2C). This provides a reasonable compromise between protection of the cells and the utilization of the battery pack capacity since by the time one gets down to 3.0 volts/cell there isn't really much energy left. This scheme is applied to 12 volt packs by at least one LiFePO4 distributor of which I am aware. In the worst-case scenario - all other cells at 3.6 volts - the "weak" cell could get down to 1.2 volts before cut-off, but this is unlikely to happen if the cells in the pack are even close to each other in terms of capacity. For battery voltages >"12 volts" this approach is not reasonable: With more than 4 cells it becomes increasingly likely that just one could drop below the lowest, safe voltage without detection. Having said all of that, the preferred method is to monitor each cell, but at least with a 2-4 cell battery with load balancing it is at least reasonable to monitor the overall voltage. FWIW, some references indicate that >3.75 volts or so is the max. voltage on a LiFePO4 cell, but the "3.9 volt" (or 4.0 volt) figure is mentioned with the proviso that it not be maintained for any longer than necessary. Like all lithium cell types better longevity occurs with the avoidance of excess voltage across a cell: For the brief exposure during charging (if it is immediately removed when charging is complete) this is likely not an issue, but this is why NO Lithium-Ion cell/battery should every be left on a charger continuously (e.g. "float charged") if it is at all possible to avoid this! I recently obtained some 20 AH (4S) LiFePO4 packs and I did not get any additional circuitry (options) with those. Charging is no problem as a constant-voltage/current-limited supply is adequate with an outboard equalizer (which I already have). For for over-discharge protection, I must remember to connect inline a circuit module that monitors the overall battery voltage, but since this circuit draws a small amount of current, it is not normally left connected - especially when the pack is not in use. "Having said all of that, the preferred method is to monitor each cell, but at least with a 2-4 cell battery with load balancing it is at least reasonable to monitor the overall voltage." - What did you mean by "2-4 cell battery with load balancing". I understood that having the cells previous balanced (equal OCV) and our pack is composed by 2-4 cells, we could monitor the overall voltage. It's my first time working in this field. I want make it well and safe. A 2-4 cell battery would be one in the range of 6-12 volts (e.g. a "2S", "3S" or "4S" pack). I can see that I mis-typed when I said "load balancing", but rather I meant "charge balancing" - this, to keep the cells equalized, to reduce the probability of the weakest cell discharging first and have it "drift" away from the others in terms of available capacity - the same phenomenon described above: Were this to happen, not only would the overall battery capacity be reduced, but it would increase the probability - particularly with a 4S battery - that one cell could discharge without being immediately detected using the "whole pack" monitoring method mentioned above. "Having said all of that, the preferred method is to monitor each cell, but at least with a 2-4 cell battery with load balancing it is at least reasonable to monitor the overall voltage." - What do you wanna means with a "2-4 cell battery with load balancing". I understood that having the cells previous balanced (equal OCV) we could only monitor the overall voltage (at least with a 2-4 cell battery). So, I will keep my secondary protection (3,9; 2,3V) and I will develop a circuit to monitor the overall voltage and disconnect the battery from the LOAD. It's my first time working in this field and many doubts are arising. We wanna make it well and safe. Thank you for your explanation! It was very useful for understanding the protections and which parts I need to have in my system. Very interesting blog. There is another very simple way to balance cells using an opamp to balance the voltage of adjacent cells in a series chain. see https://patentimages.storage.googleapis.com/US20050077875A1/US20050077875A1-20050414-D00000.png as you can see its subject to patent although its arguable that the circuit is so elementary as to not be patentable, being a circuit that has been used countless times before to derive two equal power supplies from a single one. In any case can be used for DIY/home use. The advantage of this is it can be in circuit all the time constantly balancing. It would of course need ultra low power op amps eg TLC27L1 or LMC6041 at typically 10 uA per channel Iq. you can use duals for a three cell system as they take 15 volt max. For resistive dividers use say 3.3Mohm resistors for only 1.2 uA extra. Another advantage , as its in circuit all the time is that it does not have to be high power as it works mostly between charges ( lots of time to balance) not solely during charge. Maybe aim to balance at 0.1C in 24 hours would only need say 10 mA so could do away even with the output transistors ( using single opamps) or use low power transistors if using dual op amps. Of course you would need to start off fairly well balanced or it could otherwise take up to ten days to fully balance a very bad battery. Thank you for pointing to that circuit - and with modern, ultra low current op amps and suitably chosen resistor values it looks as though it could be left permanently connected. The only concern is that if a particular pair of cells that happened to be on the same EQ circuit were equally unbalanced, this circuit would not address that particular instance. Nevertheless, it is a circuit that I'll file away in the back of my mind as I've run across several instances over the years where an "enforced" mid-supply would be of great use. I never attempted to store my LiFePO4 batteries at a partial charge or have been warned to do so. For cobalt based batteries, their capacity degrades much faster when stored at full charge. Does it really apply to LiFePO4? LiFePO4 has a longer calendar life than LiCoO2 and LiMn2O4. I believe that the admonition against keeping lithium cells always at "full charge" voltage also applies to LiFePO4 - but is less-stringent. For example, makers of very large LiFePO4 battery packs (in the 100aH class) often "suggest" that one not keep it at full voltage, but tellingly, last I checked there weren't any warranty implications if one did so. As an update, the batteries that I mentioned - purchased in 2010 (8 years ago at this time of this comment) - were recently checked and their capacity was about 75-80% of that when they were "new" - a bit lower than I'd hoped, but still pretty good. I only put these batteries on a charger before/after using them, the rest of the time they simply sit on the shelf. While I DO appreciate comments, those comments that are just vehicles to other web sites without substantial content in their own right WILL NOT be posted! If you include a link in your comment that simply points to advertisements or a commercial web page, it WILL be rejected as SPAM! 50 years since operation "Red Line"
(c) 2012 by Clint, KA7OEI and other parties as noted. Simple theme. Theme images by merrymoonmary. Powered by Blogger.